The day starts like any other – a bit of trivial hashtag banter, a share of a new infographic, and answers to customer queries. But then an unexpected and highly negative comment kicks you right in the sentiments. Followed by another. And another. You try to take the complaints offline. “DM me your email,” you tweet. “Call our support line,” you post on Facebook. But the attacks, complaints, and heckles keep on coming. Eventually, someone adds a witty hashtag and that’s when your day really starts. 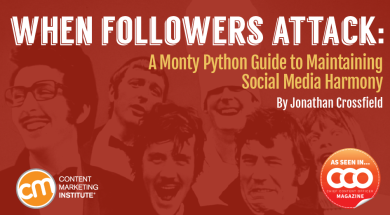 A social media attack can be quite a surreal experience, leaving you as bewildered and frustrated as a character in a Monty Python sketch. The trick to finding the right punchline is to know which Python sketch you are in. Let’s deal with trolls first, as they’re often misunderstood. A troll isn’t just anyone who criticizes or unleashes anger at your brand on social media. The Oxford English Dictionary defines “troll” as: “A person who makes a deliberately offensive or provocative online post,” intended to cause distress, disruption or elicit an angry response. You can’t reason with trolls because their goal isn’t to solve a problem, discuss an issue, or provide feedback. Trolling is about deception – trying to keep you on the hook for as long as possible by convincing you that the complaints or claims are genuine. The argument is the goal and your frustration is the reward. No matter what you say or do, the troll will contradict, confound, and contest all attempts to calm or resolve the situation. That’s why the best advice is always: “Don’t feed the trolls.” If it becomes clear that someone is only interested in ruining your day, politely call an end to the conversation. Once a troll realizes you can’t be baited further into responding, he or she will lose interest. However, while you should ignore a troll, you shouldn’t ignore any other social media heckler. It might be tempting to treat them as trolls, as it allows you to ignore a difficult situation or dismiss their criticisms, but you may inadvertently trigger a much bigger situation. I wish to complain about this parrot what I purchased not half an hour ago from this very boutique. Oh yes, the Norwegian Blue. What’s wrong with it? I’ll tell you what’s wrong with it. It’s dead, that’s what’s wrong with it! Look, my lad, I know a dead parrot when I see one and I’m looking at one right now. Think about when someone has made you angry. If that someone refused to acknowledge your concerns or offered feeble excuses, you probably became even angrier and more determined to be taken seriously. This is the difference between a troll and a genuine complaint. The anger is genuine and, if ignored, may come back in a very public manner. And if that single spurned complainant finds other equally unsatisfied customers online, you may find yourself facing the online equivalent of flaming torches and pitchforks. Just like United Breaks Guitars, there are many other examples of brands fueling a social media storm by refusing to treat a complaint with enough respect or by constantly dodging accountability … but I can’t advise you how to handle such a social media backlash, as social media usually isn’t the problem. In each case, the real problem was elsewhere in the business. Someone at United broke Dave Carroll’s guitar and someone else dismissed the angry complaint. By treating the resulting firestorm as an exclusively social media problem, the brand once more trivialized and dismissed the core complaint or community concern. If your brand chooses to blame social media for causing the problem instead of identifying what really needs fixing, then, to be blunt, you deserve everything you get. But not every customer backlash is justified. Sometimes, a brand can be victimized by a fanatical protest it could never have expected. Now, how do you plead? We’ll soon change your mind about that! Unlike trolls, fanatics definitely want your brand to do something and won’t stop protesting or heckling until you do. But unlike a broken guitar or dead parrot, the dispute may be unfair, unrealistic, or just plain wrong. So how do you handle the constant disruption and attacks from a fanatical inquisition that considers your brand guilty until proven innocent (and probably not even then)? To reclaim its social media channels from the angry mob, Vegemite decided to get in front of the controversy with a media release and a carefully worded post on its Facebook page. While we enjoy a bit of banter as much as the next breakfast spread, anyone who insists on posting comments of hate, religious vilification, or unwarranted grumpiness will be removed from our social media pages. 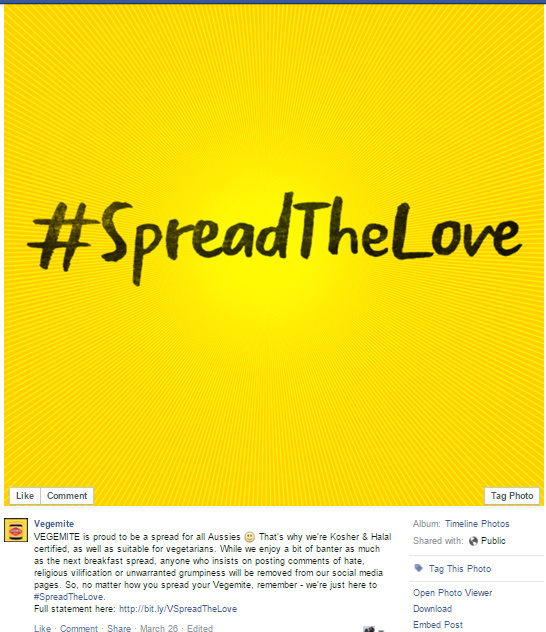 So, no matter how you spread your Vegemite, remember – we’re just here to #SpreadTheLove. The Vegemite team used the ensuing comment thread to reply to relevant comments with the brand’s side of the story, while providing the facts about halal certification in a calm and conciliatory manner. This tactic also contained the argument to a single thread and hashtag, instead of allowing the debate to dominate the brand’s Facebook page and other social media channels. The carefully moderated environment encouraged more of the community to speak out in defense of the brand, spreading the message across Facebook and tilting the weight of the conversation away from the protesters. Defending a brand against a social media attack isn’t easy. Knowing when to bend and when to stand firm (and when to walk away) takes experience. It’s a good idea to have a plan in place to deal with a sudden social media crisis – when to escalate, who should be notified, and how to move the conversation out of the public arena where you can. But it’s virtually impossible to come up with a script or series of responses specific enough to get you out of trouble in all situations. Some attacks – such as the Boycott Halal campaign – just can’t be predicted and certainly can’t be resolved with generic responses. So, don’t treat all attacks the same way. Determine what you’re dealing with, follow your agreed process, and develop the most appropriate response for the specific situation. That’s why some days can be tough. It ain’t all memes and hashtags. Then again, I never planned to work in social media, you know. I wanted to be … a lumberjack! This article originally appeared in the October issue of Chief Content Officer. Sign up to receive your free subscription to CMI’s bimonthly, print magazine. Find more best practices and rules of engagement for working with today’s top social media platforms. Read our Content Marketer’s Guide to Social Media Survival: 50+ Tips.